Are you more intelligent than people around you? Support your nation in the competition Only exceptional individuals have an IQ above 130. 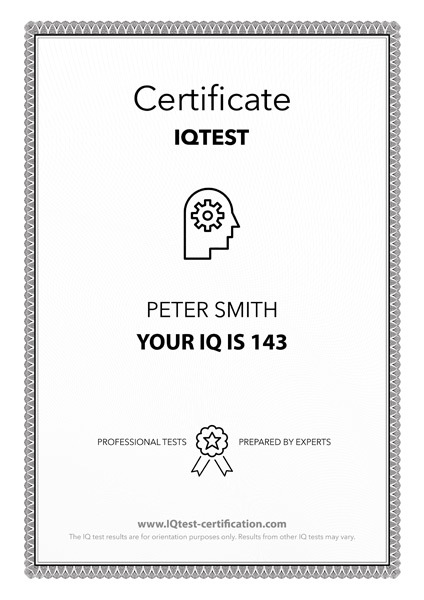 IQ above 150 is a sign of a genius. Where do you fall? Are you more gifted than the majority of people? Try our online IQ test and you will find your IQ within 30 minutes. And you get a free certificate! The average IQ is 100. Support your nation in the competition Only exceptional individuals have an IQ above 130. 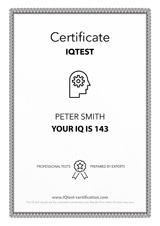 IQ above 150 is a sign of a genius. friends. Who has a higher IQ? The situation changed significantly in 19th century with the emergence of psychology. In 1890 psychologist James McKeen Cattell for the first time used the term "test" in connection with human intellect. However, the real testing still had to wait. It only started in 1890 with Simon and Binet and their Binet-Simon test that is so important for the history of measuring intelligence. Binet and Simon work was in 1912 taken further by the German psychologist William Stern who additionally included both the mental and chronological ages and introduced the term "intelligence quotient" defined as: IQ = mental age / chronological age x 100. Join hundreds of Facebook users who trust us.